I can understand why painters love sunrises and sunsets. They sell well. Both are visually striking, symbolically linked to new beginnings or twilight romanticism, but above all, it is possible to paint them in a more striking manner than what the reality is offering us within its daily urban diet. People who live in cities don’t see much of either anyway. Why then do painters miss out on volcano eruptions? I feel there’s demand for them among the adventurous, explosive, and testosterone rich. Look at Etna, informing Sicily that the planet was feeling a bit flatulent the other day. Imagine this photograph to be a painting though. I bet art critics would write it off as a painter’s reference to a childhood accident with a box of matches, and what the painter’s father said about it afterwards. Critics would scoff at the painter’s implied intent to give the viewer cheap thrills through overdramatisation. And, you know, I’d be among those critics too. We say “wow” to a photograph like this without questioning it (I hope you think it’s awesome too), because a photograph of an eruption has the documentary quality of a fact in much the same way that a painting doesn’t. A painter invents and creates conflict in his work, and to avoid copying from a photograph, he would have to make the conflict more…dramatic, because there is no point in making it less dramatic. And, trying to make it “better” the painter would make it false and pretentious. Indeed, in all the history of art, only a few volcano paintings are worth a second glance. So, what do the famous painted eruptions have that makes them interesting? Some of the eruption paintings are pure documentaries of artistic experiences. A modern consumer may not believe it, but before smart phones, artists usually had to be physically present at an eruption scene to sketch and remember it. Alas, these documentary illustrations have lost all their illustrative value once the public got access to colour photos. It is surprising, really, how few eruption artworks proved to be disruptive enough to stay in art history. The ones that remained are less about volcanos and more about their impact on the surrounding nature and people. Joseph Wright of Derby, an English painter, more known for his Caravaggio-styled paintings of scientific advancement in 18th-century England and failed attempts to win clients from Gainsborough, set the tone for volcano painting with dozens of works inspired by Mount Vesuvius activity he witnessed in Italy (he missed the big eruption that happened a few years after he left Napoli). His set the golden compositional standard for the theme: he would contrast tranquility of the sea and the dead light of the full moon against the startingly alive fire of the volcano, throwing in a few people at the foreground, who watched the eruption apprehensively or were doing their usual stuff while stealing alarmed glances at the mountain going whoopee. Joseph Wright, 1776-80, Vesuvius in Eruption, with a View over the Islands in the Bay of Naples. The islands he painted can not be actually seen from the vantage point but help to emphasise the stillness of the sea. Wright’s approach to the portrayal of eruptions gave rise to a whole school of painting, appropriately named the Volcano School that existed in the Aloha State in the late 19th century. It consisted of two dozens of non-native artists lured to the islands’ non-stop volcano activity. None of them could take the theme beyond the compositional ideas of Joseph Wright, so I am not showcasing their work. Some forty years after Wright, Johan Christian Dahl, a Norwegian artist, witnessed a real eruption of Vesuvius, and created one of the most striking images of volcanos, shifting the focus from Man as Victim, to Man as Explorer (though many believe it is about Man as a curious-idiot-who-doesn’t-know-when-to take-cover-until-it’s-too-late). Still, just like Wright, Dahl tried to embrace the unembraceable by squeezing a massive eruption scene and two tourists with their guides and mules into a single painting. The human aspect of the story was pushed to the sidelines, again. The artist who realised that you don’t have to show the whole eruption to convey its horror and beauty, was a Russian. Nikolai Yaroshenko painted this Man Vs. Nature statement in 1898. It is unfair that it is virtually unknown. The two tiny figures at the edge of the crater stand firmly in stark contrast against the unfathomable power of the volcano, and the stones that blast out and would start falling any moment make me, the viewer, cringe and awe at the courage of the explorers. In terms of colour, this is a clever piece too. Yaroshenko reinforces the conflict by using complimentary colours. He contrasts the green shoulder of the crater against the red of the fire inside it, and the orange lighting of the cloud of smoke in the centre with the blue shading of the mountains at the back. The most famous volcano painting was also done by a Russian artist who lived in Italy at the time. It is the Last Day of Pompeii by Karl Bryullov. When exhibited in Milan for the first time, it brought Bryullov (who was 30 at the time) to such fame that people in theatres would stand up and applause him whenever they’d notice him entering, and admirers would literally lift him up in their hands and carry their hero through Milanese streets if they saw him walking. This painting is a great example of classicism fused with romanticism, as well as Bryullov’s passion towards a beautiful Russian princess who posed for one of the women in the painting. But, as it is not, really, about a volcano eruption, I will not talk about it, except for one thing. Everyone is running, stumbling and trying to get away in this painting. And yet, its composition is constructed in such a way that you KNOW they won’t escape from the box of the painting. Take a moment to reflect on how this is achieved, it’s fun. Surprisingly, volcano art ends here. I’ve got nothing else to show. How tiny is this heritage if compared to millions of sunrises and sunsets you find in galleries and museums! The irony in this comparison is that without volcanos some of the most famous sunsets would not exist. A group of Greek and German scientists studied red-to-green ratios in sunsets by famous masters and discovered that the more artistically and emotionally sticking sunsets were painted in the years immediately following volcanic eruptions that created a imbalance in the atmosphere resulting in sunsets having more reds and oranges with greens and blues filtered out by ash particles. This link takes you to their paper, which you will have no problem to understand if you have a Physics PhD in your pocket or a healthy dose of masochism in your character. PS. Before you click out of this blog, please tell me if you are interested in me talking more about Bryullov or romantic classicism makes you sick. And if you missed my previous post on art use in movies, check it out – I’d love to know what you think. This entry was posted in Art and tagged Art, Joseph Wright of Derby, Karl Bryullov, Nikolai Yaroshenko, Painting, Photography, Vesuvius, Volcano on December 6, 2015 by artmoscow. Escher was real. In India. If you thought M.C.Escher’s reality-twisting drawings were a by-product of his imagination totally irrelevant to Man busy with remodeling his terraced house, go through this gallery of Indian temples step wells by Victoria Lautman (and some Escher drawings), and think again. I don’t remember when was the last time ancient architecture stunned me so much. This entry was posted in Art, Photography and tagged Art, India, Indian Temples, M.C.Escher, Photography on October 8, 2015 by artmoscow. I spent the last weekend in the mountains, in the Chamonix area in France, where I took a million pictures while doing my first hiking tour ever. A very good friend of mine, madly in love with mountains, glaciers, and art came up with an idea that painting a mountain is very much like painting a portrait. It is impossible to paint a mountain properly if the artist who embarks on the painting is not aware of the mountain’s origin, history, the way it has been maturing, etc. Getting to know a mountain is also about learning of its behaviour in different light, and weather. Mountains can have a very different view of humans depending on the time of year or the season. Of course, it is always possible to trace a photograph onto a canvas, but what’s the point in in painting then? As people generally love watching mountains, taking pictures of mountains, and remembering mountains, there is a horde of artists who churn out mountain images and even tell you about their secrets on YouTube. Do they add anything to the understanding of mountains, human infatuation with the huge rocky things, or the human character with all its strengths and weaknesses that manifest themselves when Man meets a Mountain? Erm. No. Turner was one of the greatest explorers of human character against the backdrop of a mountain ridge. Roerich established a spiritual link to Tibet via his shapes, colours, and mad beliefs in the Mother Earth (or something similarly crazy). Raise your hand if you know someone else! I’d love to know more “mountain names”. In the meantime, here are a few views that impressed me so much I got interested in finding more mountain portraiture painters! UPDATE: Boryana, a good friend of mine and an amazing artist suggested Cezanne and his 60 paintings of the mountain Sainte-Victoire as an “mountain artist name”. Of course! Especially in view of his own testimony: he wrote that needed to know the geology, and specifically the geology of Sainte-Victoire because it moved and improved him. I can’t stop wondering how Cezanne’s ideas resonate with those of the friend of mine who compared painting mountains to portraiture! This entry was posted in Art, Surprising Life and tagged Art, Chamonix, France, Mountains, Photography, Travel on September 23, 2015 by artmoscow. Now that we have explored the ground floor of the Giovanni Fattori museum and haven’t yet seen anything from Giovanni Fattori himself, we need to get one floor up, to finally get to know the painter. And what a staircase is it to climb! On my scale of gaudy, it stands a notch behind Jeff Koons. Yes, ceramic banisters of traditional Tuscany design are interspersed by putti. They are far from being happy, what with the iron rods stabbed in their heads! If you bend down to get to know them better, you get a feeling that something creepy must have been happening in this luxuriant and opulent villa when its owners were alive. Once you’ve mastered the stairs, catching an unhealthy dose of putti suffering along the way, you get to a spacious hall with a lot of people on the ceiling. It is an interesting moment in the history of Livorno, and art history, in general. It is the unveiling of an addition to a monument to Ferdinand I de Medici in 1624. The statue itself was erected in 1601 to celebrate naval victories of Ferdinand over Moorish Corsairs. The statue was made by Bandinelli, an admirer and rival of Michelangelo but without any talent for large forms. I wrote about the guy here, and if you have been to Florence, you must know his major work that stands next to David. More than 20 years later after Ferdinand the Victorious was erected, it was decided to add captive Moors, who – coming from North Africa – were usually dark-skinned or black. Painted bronze was seen as a fitting material, and Pietro Tacca, a former pupil of Giambologna, was commissioned to make four figures of defeated pirates. It’s not often that one can see a sculpture which accessory part is better sculpted and more expressive than the main one. An observer cares more about the Moors than the dude who defeated them. Everything about them is spectacular: their twisted bodies, their faces, of which some are rebellious, and some quite resigned. There is a legend that Tacca used two real slaves as models for his sculptures who were set free when the work was completed. One of them settled in Florence, but would take his family to Livorno whenever possible to boast of the likeness of his face to one of the bronze Moors. Of course the Moors don’t look as black today as in the ceiling fresco, but someone who doesn’t know the real history behind this sculpture may see the whole composition as an offensive symbol of racial superiority. And, believe me, in the presence of black people selling fake bags nearby with white tourists taking pictures of the monument with their uber-expensive Leicas, Canons, and Nikons, this modern interpretation of a historic sculpture does not seem all that irrelevant. Enough of the creepy stuff. Our next stop is at Italian art of the 19th century. This entry was posted in Uncategorized and tagged Art, Baccio Bandinelli, Italy, Livorno, Mannerism, Photo challenge, Photography, Pietro Tacca, Travel on August 14, 2015 by artmoscow. What I love about Italy is that it is a patchwork of different epochs, styles, and cultures, which are often quite opposing and contradictory but peacefully co-existing. The symbol of Yin & Yan should have been invented in Italy. Take Forte dei Marmi, a paradise spot for millionaires, their kids, nannies, fitness instructors, and cocaine suppliers. It is white (no black people except peddlers of fake LV bags), posh, and clean as the bottom of a cat with obsessive compulsive disorder centered on the cleanness of its bottom. I know some people believe cats are normally born with it, so imagine it to be double the norm. Its boutiques stay open until midnight absorbing the apre-dinner crowd wearing a relaxed mix of casual attire and expensive diamonds. If you cringe at “expensive diamonds”, trust me, it is not a tautology in Forte. There are diamonds, and there are expensive diamonds; and the latter are noticeably different to the former in size and quantity. It’s the kind of diamonds that make you murmur, “It must be a fake” when you see them except that they are not. Don’t worry, though, Forte is a safe place. Of course, once a year a Rolex gets forced off the manicured hand of its wearer or a villa is robbed while its residents are put to sleep by some soporific gas, but given the number of Swiss watches and luxury homes in the area, it’s a small price the rich have to pay for being open-minded about the inclusion of the more unstable East European countries into the EU. Ultimately, the Forte’s rich would either earn their money back off those nations or steal it from their own. Fair’s fair. And yes, the word “earn” in Forte has a very different meaning to the same verb in, say, neigbouring Livorno. In Livorno, the opposite of Forte, you don’t wear an expensive watch, because Livorno’s large immigrant community keeps a close watch on you at all times. A non-prejudiced tourist may take those stares for a sincere wish to help with city navigation, but the inner genius of intuition whispers that it is better to stay inconspicuous. Show off is never welcomed by socialists, and there are many of them in Livorno, for it is a place that has been holding socialist ideas close and dear to its heart ever since the communist party was founded there almost a hundred years ago. Not that Livorno’s infatuation with communism has done anything good for the city. It is not a prosperous community, not very clean, and you won’t be able to pop into a Hermes store after your mid-night MacDonald’s dinner. While activists are busy leaving communist graffiti on the walls of public buildings, its churches crumble, its businesses twinkle out of existence, its palaces decay and peel off as if cursed by their capitalist ex-owners, with the net effect of activists’ leaving even more communist graffiti. Do I like Livorno? Well, you might have already guessed that I hate Forte dei Marmi, the modern vanity fair for corrupt politicians, oligarchs (mostly Russian and the former ex-USSR, of course) and their menials. Forte is not a place where money creates anything good or anything at all. I am allergic to it so much I never take pictures there, and leave the town as soon as the annual obligatory dinner with friends who happen to like Forte is over. But, if you are interested, here are some good links 1, 2. My dislike for Forte (let’s say it is Yin) doesn’t make me a big fan of Livorno (which is Yan), though. I am a firm believer that socialism is bad for you. If you contract socialism, you need to be isolated at the first signs of the disease . If you happen to be a socialist, please don’t even think about dissuading me: I’ve lived a half of my life under this “just” social order. Very few things make me happier than hitting a communist on the head with a tome of Das Kapital by Karl Marx. Yet, Livorno is Italy, and Forte is not. It can be easily proven by arts and culture. In Forte, art galleries are outlets for gaudy po(o)p art that discredits the country’s culture and heritage. In Livorno, good art can still be found, and to see it we’ll go to Museo Civico Giovanni Fattori. It is housed in a building that doesn’t strike you as a museum (Yan). It looks abandoned, like a homeless person slumped against the wall, when you are not sure if he is asleep temporarily or eternally. As you enter it, you are hit by the past glory of the prosperous capitalistic Livorno (Yin) mixed with the scent of imaginary mothballs (there are no real mothballs there, but you still can feel the smell). Putting contemporary art in a historic setting is one of the oldest curatorial tricks to show that creative life is still pretty much alive and kicking, and it is also a kind of Yin&Yan. Yet, when I was there, I had a feeling Livorno’s contemporary art has lost the vitality required to make something beyond eye-pleasing decorative pieces. Perhaps, it was just too hot outside, and I missed the breakthrough kind of art. Fortunately, there are a few great artworks well worth a detour, as they say in tourist guides. 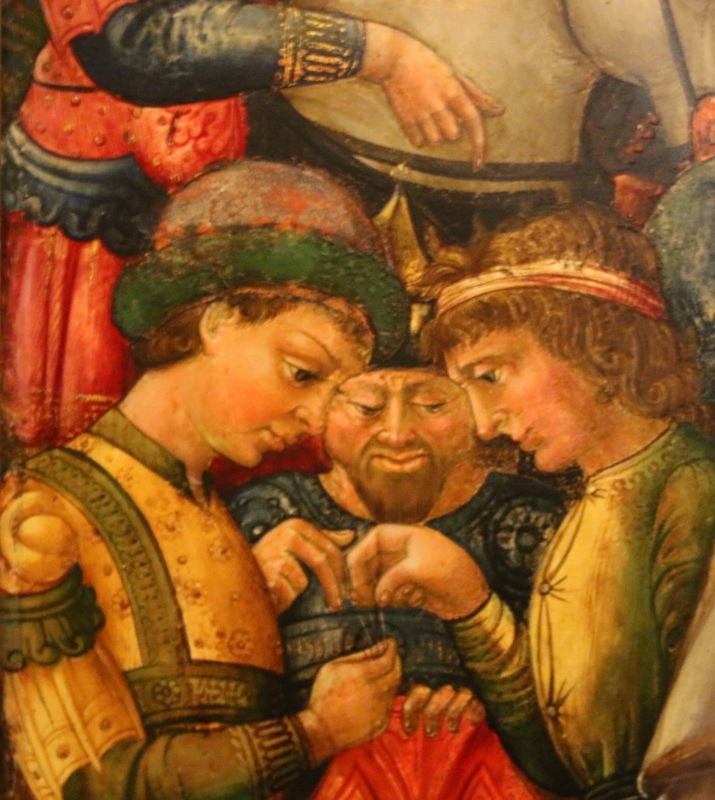 This painting by Neri di Bicci is a good example of the decorative branch of the Renaissance that ultimately peaked out at Botticelli (as opposed to the humanistic chapter of Masaccio and Michelangelo). 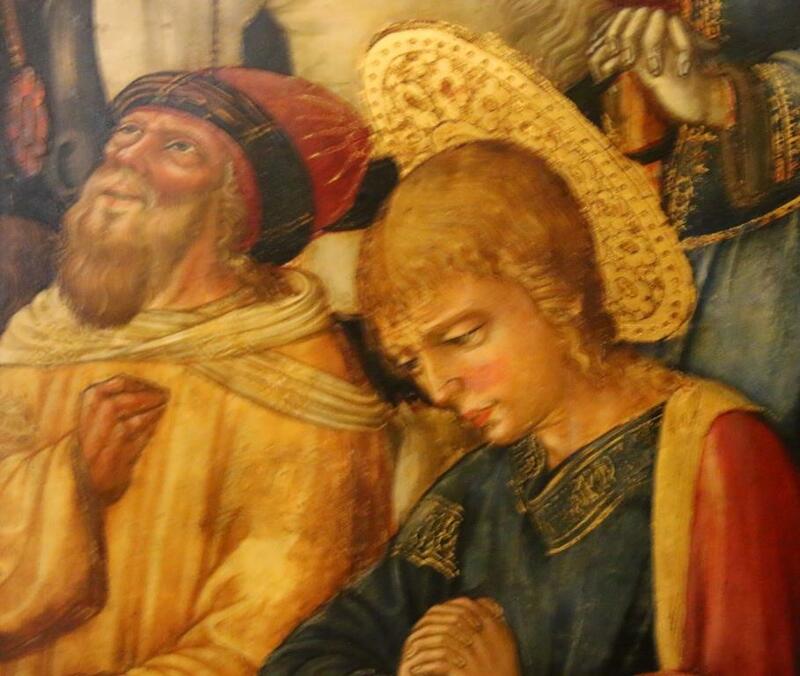 If you have been to the Medici Palace in Florence, and visited the Magi chapel frescoed by Benozzo Gozzoli, you’d understand what I mean. Why is it an interesting piece of Renaissance art? It is a multi-figure composition where everyone is visible and has a role. Bicci shows a broad range of emotional states: sorrow, contrition, disinterest, curiosity, disapproval, approval, etc. You can play a game of mapping emotions against each character or group of characters in this painting and see if you and your friends are good at recognising emotions. I will focus at a few elements in this painting, but before that notice how this representation of Christ’s last passion is soaked in passionate red. It was an expensive colour at the time, by the way. It is a very narrow strip of land that is painted in such a way that it creates the feeling of a flat on which the whole composition is built, and takes you inside the painting, without directing you to anything particular at all. Clever. The beauty here is not in the suffering of collapsing Mary (that was not an innovation even then), but the attitude of the saintly ladies who support her. They don’t have time to cry or agonise over the Crucifixion, which has already happened; they have a more immediate and pressing task at hand. They don’t look up at Christ: that can wait. They care about his mother. And that is very true, much more so than the scenes painted with greater mastery by Rogier van der Weyden about the same time, or by Rubens much later. When an old woman collapses one has to look down to support her, and even if the old woman doesn’t collapse (but you know she’s suffering a lot) you don’t lean on her while walking at the same time. This is an important scene to which attention is drawn specifically by the hand and finger of a mounted man above them. Roman soldiers are drawing straws for Christ’s possessions. They stand next to the group of mourners but seem oblivious of the dramatic events taking place around them. They are fully engrossed in their get-rich-quick game. Of course it was meant to be a moral lesson (with the point driven even further by having the three ages of man in this group), but… yeah, men are like that. The whole world would be collapsing around them, and they’d keep thumping through news on their iPads. Yes! Women tend women, men think of bigger issues. One man looks up, St.John looks down, and the observer looks up and down, thinking of Christ’s sacrifice and his own future lifestyle choices. St.John didn’t come out well on my camera, but the strained concentration on his face can still be seen, that together with his clasped hands tell you a lot about the inner pain inside the man. This man is the most ugly character of all the Roman soldiers. He enjoys inflicting unnecessary pain on a powerless condemned brigand as a cruel boy pinching wings off a fly to see how it’d wriggle, unable to take off. His helmet is splashed with blood that he doesn’t seem to notice: the suffering of the crucified man is holding his undivided attention. You probably won’t shake the man’s hand if you met him socially, but…look inside your own mind and remember if you have ever inflicted unnecessary pain on someone. The point is not to brand the man as a horrible brute. This Crucifixion is an interesting piece, but we have to keep going, and climb an amazing staircase to the first floor with 19th century paintings by Giovanni Fattori there. And that’s when the tortured babies come into play, the total Yan to Neri di Bicci’s Yin. Stay tuned for the horror, I’ll post it soon. This entry was posted in Art and tagged Art, Forte dei Marmi, Italy, Livorno, Neri di Bicci, Photography, Travel on August 13, 2015 by artmoscow.